Post: Gaurav Akrani. Date: 10/12/2015. Comment (1). Label: Economics. Law of Demand can operate and remain valid only if certain things like income, population size, climate, consumer's tastes and expectations, etc., are assumed to remain constant or equal. In other words, there is a need for an assumption or a consideration that these things do not change at all under any circumstances. Image Credits © Gaurav Akrani. No change in the income. No change in size and composition of the population. No change in prices of related goods. No change in consumer's taste, preference, etc. No expectation of a price change in future. No change in the climatic conditions. Now let's discuss each assumption of the law of demand one by one. The first assumption regarding the law of demand to operate is that the income of the consumer must remain same or should not change (i.e. neither rise nor fall). Income is assumed to remain constant, since, its rise may lure the consumer to buy more goods and raise demand despite an increase in the commodity prices. The second assumption for the law of demand to function is that the size and composition of the total population of a country should not change. In other words, the population must neither increase nor decrease. Here, it is assumed that the population size and its composition must remain constant because a rise in the number of people would also increase demand for commodities even when their prices are higher and vice-versa. 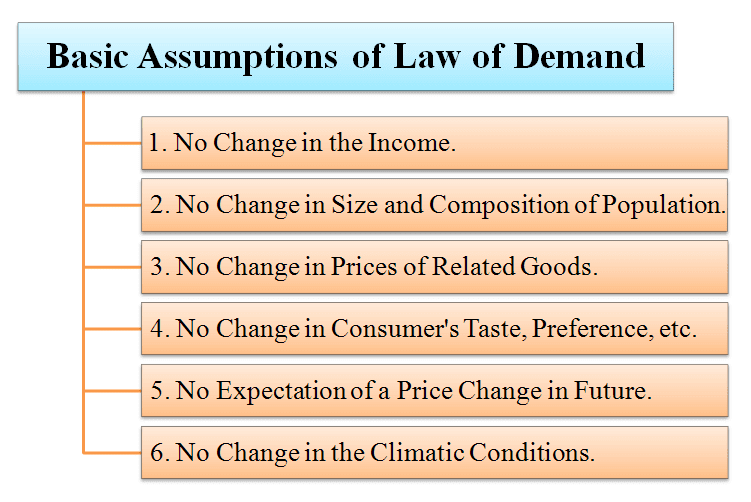 The third basic assumption of the law of demand considers that the Prices of Related Goods (i.e. Substitute Goods and Complementary Goods) don't change and remains same. Here, it is assumed that the Prices of Substitute Goods (like Tea and Coffee) and Complementary Goods (e.g. Petrol and Cars) should not change. It is considered so, since, a change in consumer's liking or choice makes the law of demand stand invalid and inapplicable. 4. No change in consumer's taste, preference, etc. The fourth assumption of the law of demand considers that the taste, preference, habit, fashion, etc., of the consumer, should remain unchanged. That is, there should not arise a newer choice or change in the mood to try something different. Here, it is assumed that the consumer's taste, preference, habit, style, so on., should not change because it breaks the functionality or validity of the law of demand. 5. No expectation of a price change in future. 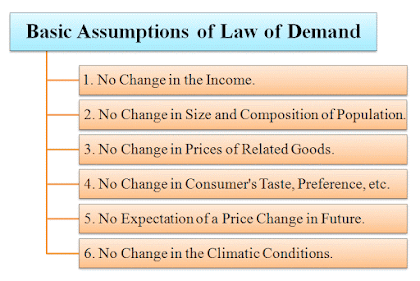 The fifth basic assumption of Demand Law to remain valid is not to expect any future possibilities regarding a change or fluctuation in the prices of commodities. Here, it is assumed not to keep any expectation of future price change because it will affect the current demand of goods. For example, if people are expecting a rise in the future prices of some goods, then the current demand for such goods will also increase and vice-versa. The sixth assumption of the law of demand is that the weather conditions or climate of a region or geographical area should remain same and not alter at all. There is a need to assume the climate to stay unchanged because a seasonal shift changes the essential needs of people. For example, the demand for umbrellas is high mostly during a rainy season and low during other seasons. Hence, to allow the law of demand to operate smoothly the climate should also be considered to remain constant.